We had a nice treat last night. 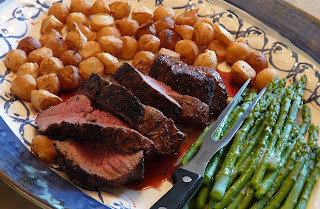 Our neighbour came over with a lovely piece of beef tenderloin. Just big enough for three. I grilled it and made Parisienne Potatoes, steamed asparagus and a Bearnaise Sauce and Clif cooked beets and yellow and green beans. A nice evening. Good food, good wine and good neighbours. 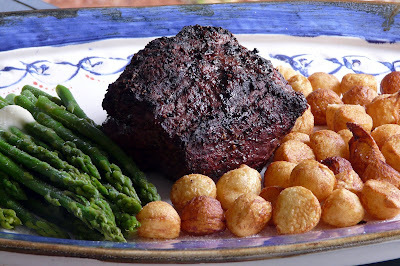 Oh to have a neighbor who would provide beef tenderloin for dinner! Looks delicious, Ann. Now thats a fabulous looking dinner! That sounds delicious! Great meal. What are Clif cooked beets? I am not familiar with the term. I love diner food. A hot chicken or turkey sandwich is on my top ten list. Kate, I apologize for my punctuation. "Clif" is our neighbour and he cooked the beets and the beans.